Shelter students come from all walks of life, but they are always interesting, thoughtful, and enthusiastic. Very often we’re asked what students at Shelter are capable of doing after taking our classes, so from time to time on the ShelterBuild blog, we profile Shelter Institute alumni and the various projects they've completed. 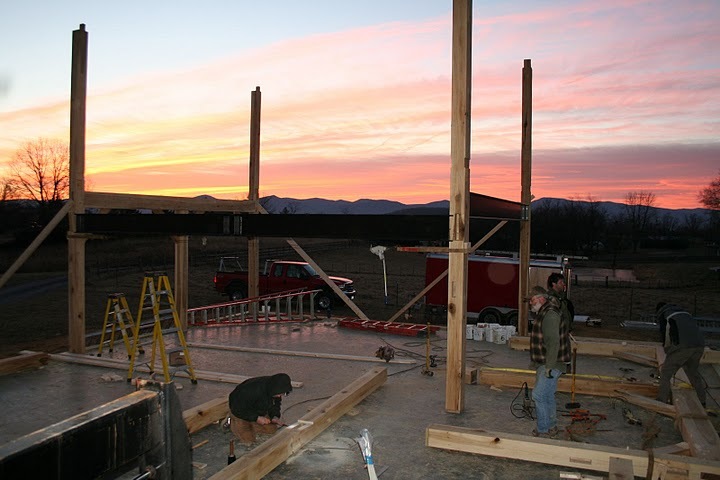 Gaius and the crew recently traveled to Virginia to help Gene and Chris assemble and raise a timber frame on their property in the Shenandoah Valley. Gene took the Design Build class in 1978 and the Purely Post & Beam class in 2004 and 2007. 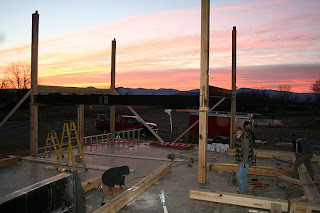 Building a timber frame has been a dream ever since. We interviewed Gene after the crew left to ask, among many things, how he finally realized his dream after thirty years of planning. Tell me a little bit about the building project. 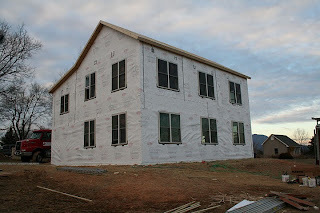 We are building a two-story woodshop and recording studio across the driveway from our home in the Shenandoah Valley. Each level is ~ 1100 sqft. of workspace. We used two steel beams on the first floor to eliminate 2 posts to open up the working space for larger projects. Equipment in the shop will include 2 table saws, jointer, planer, shaper, band saw, lathe—essentially capable of building almost any type of project. The second level includes an open recording area ("live" room) with roof peak at 18', a fully equipped control room, vocal booths and a lounge area. The 'hands-on' aspect of the Post & Beam class was by far the most useful to me..... Post-class discussions with the Shelter team once you are involved in a project are also extremely useful. The structure is standard post & beam with 6" SIP [structural insulated panel] walls and roof providing a highly insulative and air-tight building envelope. I will have to ventilate to prevent moisture and stale air buildup. We also used 4" SIP panels for the second floor to provide a complete air seal between floors to minimize/eliminate dust/sawdust transfer from the woodshop area into the studio area. The second floor is designed to commercial specifications of a minimal load strength of 100 lb/sqft (30 lb/sqft is standard for residential construction) so that I can operate the studio as a business location in the future. 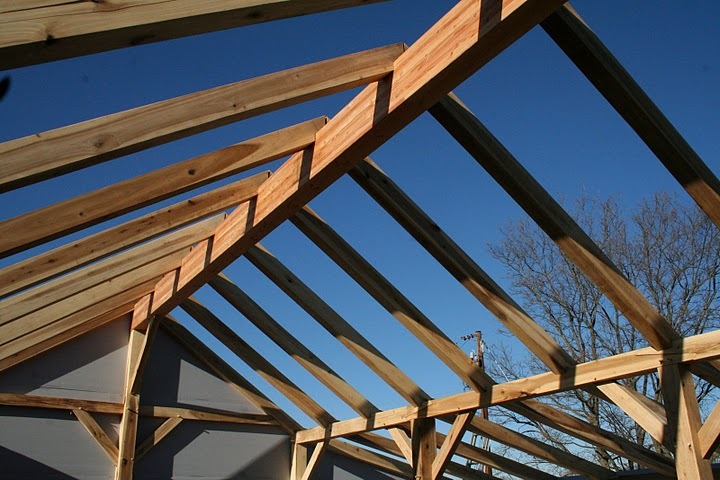 To obtain the higher load rating the floor joists rest on top of the beams instead of being dovetailed into them so that raises the overall height of building. The timber used for the structure is locally cut yellow or tulip poplar. Timbers range in size from 4" x 6" for braces to 8" x 14" for some of the beams. The ridge beam is a manufactured beam about 8" x 16" and 36 feet long. It was beautiful watching the crew fly the beam up and settle it into place in just a few minutes. Do you have a background in building or woodworking? I am currently a Principal Engineer at the Merck production facility in Elkton, VA. I am a certified "natural science geek," with an undergraduate degree in chemistry and doctoral degree in chemical engineering. I have to know how/why something/everything works. Fortunately, my technical troubleshooting role at Merck allows me to tackle new and different issues on a regular basis. Outside of my technical career, I have pursued music and woodworking for most of my life including a three-year stint as a cabinetmaker in my twenties. Given the more than 20 years between taking the Design Build class and the Post & Beam class, did the size or type of project you had in mind change over the years? When I attended the Design Build class in 1978 I did not have a specific design in mind but was sure that I wanted to take a very active role in the design and building of a home. My wife, Chris, and I kept the ideas from the class alive as we moved back and forth across the US (upstate New York, Seattle, WA, New York/New Jersey and finally on to Virginia). Until we reached VA (Shenandoah Valley) we never found a place that we were willing to commit to as a long-term/permanent location. With that uncertainty, we remodeled various homes along the way, using concepts from the Shelter class, but didn't consider building until recently. As I approach retirement from professional engineering I intend to keep working and so the workshop/studio design will allow me to feed both the woodworking and the music passion. Blueberry shared that you brought your brother and your wife to two different Post & Beam courses. Was it hard to get a team together? Were they up for the project? I knew that this project was more than I could tackle alone, and Chris is my best friend and life partner so she was included from the beginning. My brothers, my dad and I built a number of buildings and additions when I was young and my brother Carl lives just a couple of hours away in Virginia. We have a history of working on projects on each other's property, and I value his technical opinion very much so he needed to be suitably trained to get the most out of our collaboration. Another integral part of the construction team was my friend Steve (Mac) McCumsey who is a member of the Timber Framers Guild and has experience on some of their projects. His advice and experience were really helpful in getting through the initial use of the 16" circular saw and the chain mortiser. Taking the Post & Beam class a second time offers some real advantages. During the first class I was tackling new tools and concepts and had limited time to look at the bigger picture. During the second class period I was refining tool technique and had time to ask tons of structural design questions. During that class, Gaius, Chris and I began our discussions concerning the original design of the woodshop/studio space. That design was later modified due to a change in location from behind our house to the current location which is much more amenable to the solar options that we plan to add in the future. What was most useful in the Shelter classes you've taken? The 'hands-on' aspect of the Post & Beam class was by far the most useful to me. The technical discussions in class are helpful but are also available through reading and have similarities to my engineering work. Laying out timbers and cutting the various joints [during the class] develops the confidence needed to tackle a building project. Chris and I also designed and built a pergola in 2009 as a practice exercise prior to tackling the main building. Post-class discussions with the Shelter team once you are involved in a project are also extremely useful. What was the most challenging? What was surprisingly easy? The most challenging aspect of the job was to commit to it in the first place. The fear of getting in over your head is a very strong demotivator. Chris has been my staunchest ally with this, and she really helped me maintain confidence that we could do this. The easiest part of the job was actually cutting the timbers once you have experience with each type of joint and layout. This is not to imply that the work was not physically and intellectually challenging but when approached logically and steadily the timbers are completed surprisingly quickly. Having the right equipment was also critical to working efficiently. If you could do it over again, starting from scratch, what would you do differently? Since I haven't really had an opportunity to use the space I don't have any design issues that are bothering me (yet). I would relocate the building to the west by 30-50 feet if the property line setback regulations would allow it to provide greater separation between the shop/studio and our house. I would have liked to have been able to work continuously on the timber cutting. I was fortunate to get approval for a 32 hour work schedule from September through December but that left me working seven days per week and the day job days were 10-12 hours long. A leave of absence for the timber cutting and finish work would have been preferable. It also would help to have two people available all of the time. I had access to a forklift which allowed me to move large timbers by myself but it would be very helpful to have a second set of eyes reviewing layouts and discussing design issues. I would also use my scoring knife a lot more to minimize the annoying wood fiber tear out that occurs. It is usually barely noticeable but as the maker you see everything. By midway into the project I was using the knife on every layout. The Shelter crew arrived on January 4th, and Steve and Thomas were installing the sill plate within 10 minutes of arriving on the site. Not including the course, how long has the project taken? The design work began early in 2010 with discussions with Gaius and Ethan. I began lining up resources at that time as well, sawyer, site grading, concrete, radiant floor heat vendor, etc. We began cutting timbers in early September and completed them right around the end of the year. The Shelter crew arrived on January 4th, and Steve and Thomas were installing the sill plate within 10 minutes of arriving on the site. That pace kept up for seven days as the building moved from concrete pad to fully assembled structure with doors and windows in place. The only items missing were the metal roof, final siding and a garage door. What kind of advice would you give to students or anyone else embarking on a similar project? My advice would be to be sure of your commitment. As I stated above, reasonable work skills can be developed pretty quickly but the focus to maintain constant attention to detail and motivation is critical to getting a quality job done. Having a reliable working partner can be invaluable in maintaining your level of commitment. My last advice is to discuss your issues as fully as possible with the Shelter team. They have been very helpful with all of the building concerns and with many other technical details such as ventilation units, composting toilets, roman shades and a host of others. Using their shared experience provides a level of understanding that can't possibly be provided by the first-time builder on their own. What's the next project you'd like to undertake? Are you doing the finish work? I am currently doing the finish work which I hope to finish before summer gets here. I'm back on a standard 5 day/40 hour work week so my weekends continue to be filled with "working on the building" and there is never enough time. After that I have several recording and woodworking projects already lined up. Hopefully some musical instruments may emerge from the woodshop area in the future. Any words to sum up how it feels to get this building project to this point? I find it hard to describe the level of pride/satisfaction that comes from completing a project like this. Making a 30-year dream come true is about as good as it gets. Sharing that with your family and close friends who helped along the way just makes it even better. The "shared experience" of the Shelter team "provides a level of understanding that can't possibly be provided by the first-time builder on their own." 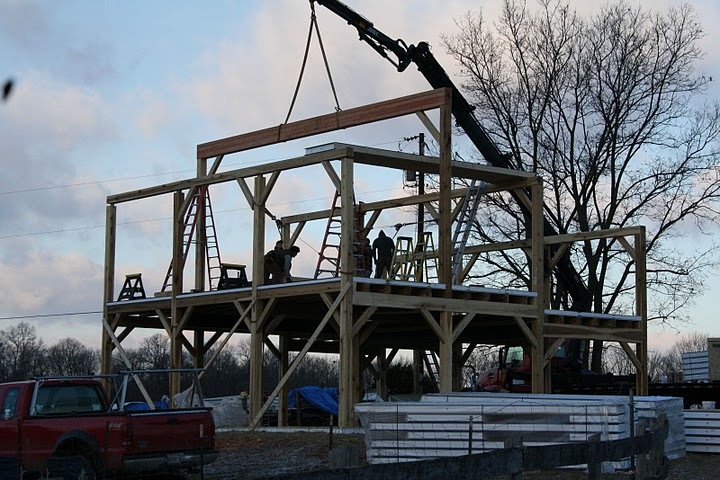 To view more photos of Chris and Gene's timber frame, visit Shelter's online photo portfolio.